Whatsapp has recently dropped yet another update for iOS users and it is extraordinary. This new privacy feature brings the much-awaited biometric authentication allowing iPhone users to lock the entire Whatsapp and chat using Face ID or Touch ID on version 2.19.20. Whatsapp’s biometric authentication feature was first anticipated in October last year. However, it does not give you any additional security to one-to-one chat. It is to be noted that this feature is yet to be launched for Android users. Whatsapp’s biometric feature will work similar the way Outlook and Signal are offering Face ID and Touch ID for many months. If you want to experience this change in your handset, you will have to download the latest version of the app from the App Store. It only weighs 137.7MB and is compatible with iPhone models running iOS 8.0 and above. Below you can read are a step-by-step method to enable Face ID and Touch ID on iPhone. 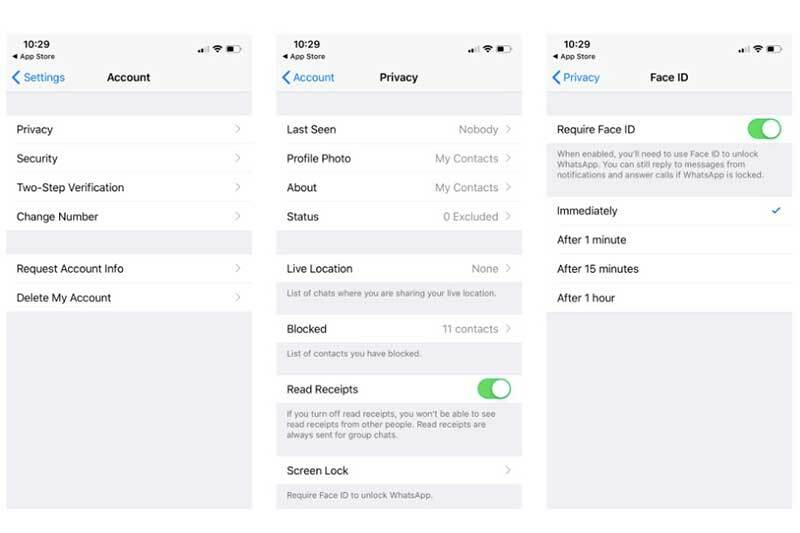 If you have the latest version of Whatsapp, you can lock Whatsapp using Face ID or Touch ID by going into setting sections>Account > Privacy > Screen Lock. Once you shifted to the Screen Lock screen, Whatsapp will show you the available authentication method — either Face ID or Touch ID — that you can enable to lock the app. You will have options to choose whether you want the biometric authentication immediately after closing the app or after an interval of 15 minutes, or an hour. When the biometric unlock security feature is activated on WhatsApp, the preview snapshot of the app will show nothing.